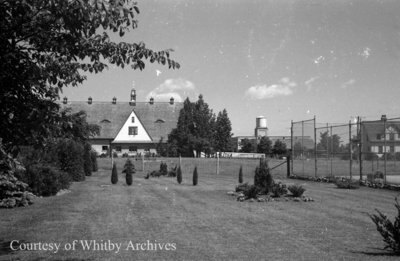 A black and white negative of the back lawn at Stonehaven taken in July of 1939. In the background are a stable and an outbuilding. A tennis court is on the right side of the photograph. Gardens at Stonehaven, June 1939, Marjorie Ruddy. Whitby Archives A2013_040_703B.